Linking survey responses with administrative data is a promising practice to increase the range of research questions to be explored, at a limited interview burden, both for respondents and interviewers. We describe the protocol for asking consent to data linkage on nine different sources in a large-scale nationally representative longitudinal survey of young adults in England: the Next Steps Age 25 Survey. We present empirical evidence on consent to data linkage from qualitative interviews, a pilot study, and the mainstage survey. To the best of our knowledge, this is the first study that discusses the practicalities of implementing a data linkage protocol asking consent both retrospectively and prospectively, on multiple domains, and in the context of a mixed-mode survey. 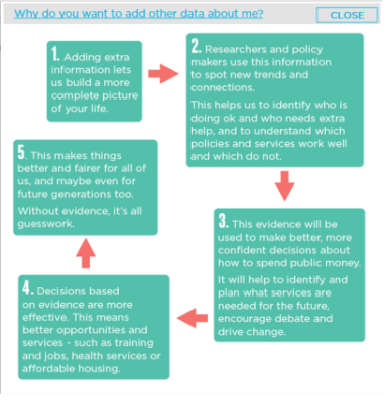 The Next Steps Age 25 Survey is funded by the Economic and Social Research Council (ESRC) and is run by the Centre for Longitudinal Studies (CLS) at the UCL Institute of Education. It was previously funded and managed by the Department for Education and known as the Longitudinal Study of Young People in England (LSPYE). Data linkage is a promising practice. It allows researchers to enhance survey data with detailed information at a low survey cost and interviewer and respondent burden. In some contexts, data can be linked both retrospectively and prospectively – adding information also for cohort members that have not participated to previous survey waves, or that may attrite in the future. Besides its potential benefits, data linkage presents methodological and practical challenges. In several countries, consent needs to be asked to respondents before linking their records to survey responses (Sakshaug et al. 2017). A substantial proportion of sample members may not consent to data linkage (Sakshaug and Kreuter, 2012) and consenters may differ from non-consenters on key characteristics, leading to consent bias (Al Baghal, Knies and Burton, 2014). To tackle these challenges, the methodological literature has mainly focused: i. on the respondents’ and interviewers’ characteristics associated with consent; ii. on how the interviewer behaviour, the interviewer-respondents’ rapport, the interviewers’ attitudes toward sharing personal information, influence the likelihood of obtaining consent; iii. on consent bias, and iv. on which wording and positioning of consent questions maximises consent rates. Recent reviews on these topics are presented elsewhere – e.g. Al Baghal and Burton (2016), Al Baghal, Knies and Burton (2014), Korbmacher and Schroeder (2013), Sakshaug and Kreuter (2012) Sala, Knies and Burton (2014). Little empirical evidence is available on best practices to implement data linkage protocols and on designing data linkage accompanying materials. This lack of knowledge is particularly problematic, since new challenges are arising in these areas. The increase in adoption of less expensive self-completion modes of data collection (e.g. web), either alone or in conjunction with other modes, urges survey methodologists to understand how to optimise the collection of data linkage consent in self-completion modes. This task presents the challenge of simulating the interviewer persuasion in a self-completion context; not surprisingly, recent experimental research found lower consent rates in self-administered modes (web and mail) compared to interviewer administered modes – face-to-face (Burton, 2016; Sakshaug et al. 2017). Also, collecting data linkage in mixed mode contexts entails logistical issues, since collecting signed consent forms is not practical in web and telephone surveys. However, there is little empirical evidence on the design of consent protocols in mixed-mode contexts. Moreover, while many surveys attempt linking data from multiple records, and for future records, consent research has mainly focused on single consent requests and on existing records. This study addresses these research gaps. We report our experience of developing a procedure to collect data linkage consents on Next Steps: a large scale longitudinal study in England of people born in 1989-90. We use data from: qualitative interviews, the Next Steps pilot study, the mainstage study, and interviewer debriefings. Next Steps is a longitudinal study of people born in 1989-90. 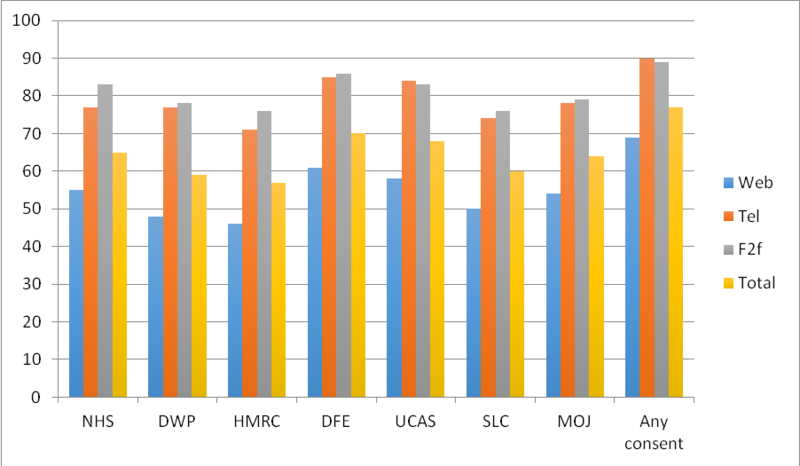 Cohort members were originally recruited from schools in England in 2004, and interviewed annually between 2004 and 2010. 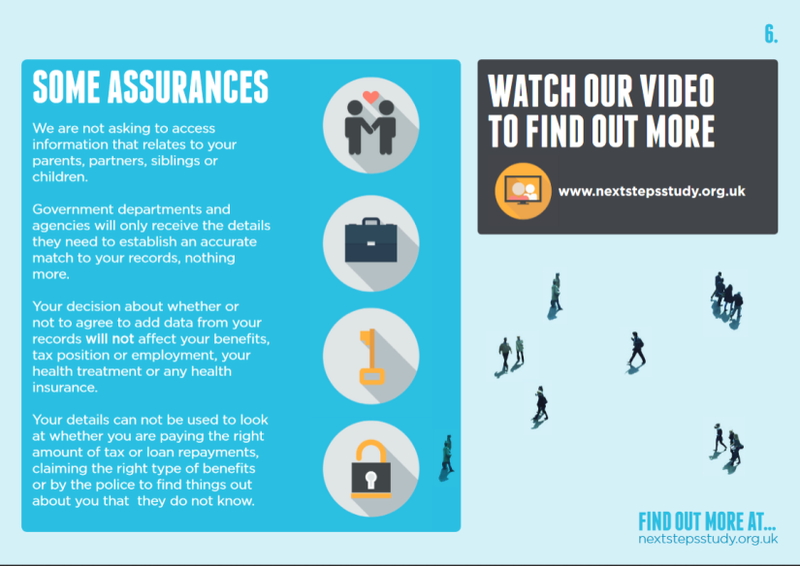 In 2015/2016 the Next Steps Age 25 Survey was implemented. It is a multi-purpose survey, collecting information on family life, economic circumstances, education, employment, etc. Next Steps Age 25 survey adopted a sequential mixed-mode design. Eligible sample members were firstly invited to participate in the survey by web; non-respondents in the web phase (who participated in the previous survey wave) were followed-up by a telephone interview. After the telephone fieldwork, all eligible sample members that had not yet taken part were assigned to face-to-face interview. In order to evaluate the data linkage consent materials and protocols, a qualitative study and a pilot study were implemented. The pilot was considered as an appropriate research design for collecting feedback on: fieldwork design and protocols, fieldwork materials, the ease of questionnaire administration, implementation of the data linkage protocol and consent rates, as well as the survey overall. However, it was considered that the pilot was not the best tool for in-depth exploration of specific issues relating to data linkage; respondents’ fatigue after a long interview would not have allowed in-depth exploration of specific topics, and interrupting the natural flow of the interview to include probes was not considered advisable. Thus, the findings from the pilot were supplemented with in-depth qualitative interviews aimed at exploring the practical and ethical issues around data linkage and to gain more detailed feedback on the proposed protocol and materials. The sample for the qualitative study was composed of twenty individuals, aged 23-27 and recruited from the general public with the aim of including a diverse group of respondents in terms of gender, educational level, and working status. Data were collected through face-to-face in-depth and cognitive interviews, lasting up to one hour and fifteen minutes. Interviews took place in participants’ homes over a two week period in September 2014. Participants received an incentive of £25 for their cooperation. In terms of study design, the interview process was conducted using a topic guide, which replicated the interview stages with respect to the data linkage consent requests. Specifically, participants were asked to review the information leaflet, use flashcards presenting the different data linkage consent questions, discuss the information leaflet, page by page, to express views on whether content was clear/unclear, whether any content was missing or leading to misunderstanding. Interviewers then explored views on framing the introductory text to the survey. Group 1, which were shown an overview of the questionnaire topics at the start of the interview. Group 2, which were given the questionnaire overview after the consent questions and information leaflet had been explored with them. Table 1 summarises the interview process. Qualitative interviewers used the following materials: a topic guide; an overview of the questionnaire content; a set of flashcards each presenting the consent questions; a list of benefits associated with data linkage; two versions of question wording; a flashcard to assess views on combining education consent questions. In the mainstage study the wording of consent questions was adapted to the different modes of data collection (web, telephone, and face-to-face) taking into account that web respondents read the questions themselves while telephone and face-to-face respondents have the questions read out to them by an interviewer. In the qualitative interviews, the web versions of the consent questions were used throughout. The pilot study allowed collection of feedback from interviewers, from participants in a post-interview questionnaire, as well as from a small number of participants who directly contacted the office. The data linkage section of the pilot study was aimed at answering the following research questions: was it useful and appropriate to send a detailed leaflet about data linkage as part of the advance mailing? Could informed consent be effectively gained (in terms of consent levels and acceptability from respondents)? Was gaining consent without paper forms feasible and acceptable? And was it feasible and acceptable to send post-interview confirmation of consents by email or letter? Were there any specific challenges of implementing data linkage consents in different modes – web, telephone, and face-to-face? The pilot study took place in October and November 2014; 120 participants aged 23-27 were recruited from the general public in three areas of England with a quota sampling approach taken in order to include a diverse group of respondents in terms of gender, presence of children, cohabitation and employment status (as well as ethnicity in London). The number of participants who completed the data linkage section was 89 (of the 96 fully productive interviews). Respondents were given a £20 incentive for participation. Participants were randomly allocated to complete the survey in different survey modes with 35 participants taking part on the web, 33 by telephone, and 28 face-to-face. 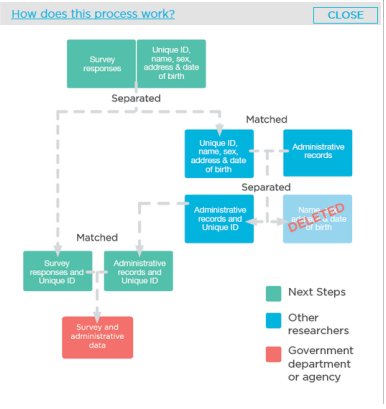 In the mainstage Next Steps survey, cohort members were asked for consent to link their survey data with nine separate administrative data records, covering multiple domains (i.e. 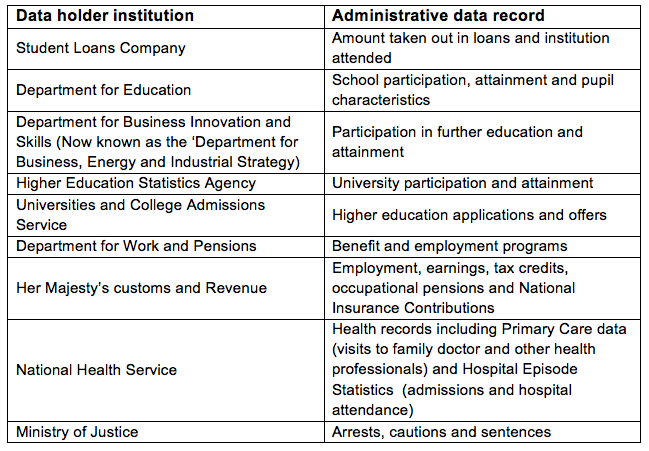 education, economics, health, and criminal justice), and held by several government departments and non-governmental bodies (Table 2). The protocol varied by mode of data collection. Web respondents recorded their consent at the “click of a button”, on a page within the web questionnaire. Consent was provided verbally in the telephone and face-to-face interviews. In all modes respondents were not required to provide signed consent, for three main reasons: i. a higher response burden (since respondents in the telephone and web fieldwork would need to send to the office signed consent forms), ii. a negative impact on consent rates (since some consenting respondents may fail to send back the signed consent forms), and iii. an increase in survey costs (associated with dispatching, chasing, receiving and processing paper forms). Most participants to the qualitative work had no concerns about the absence of signed consent; only in rare circumstances respondents expressed concerns that could result in the decision to not provide consent, unless a written signature was collected. 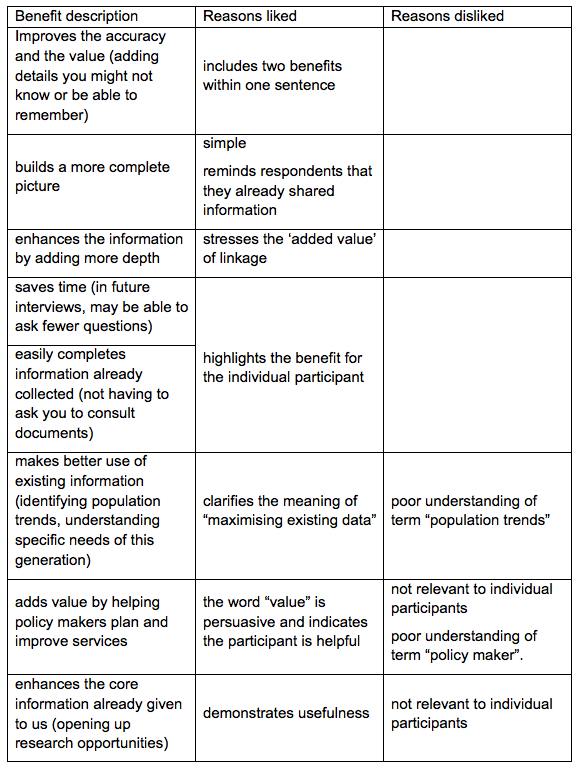 Before the survey, respondents received an advance letter – mentioning the data linkage questions and signposting to further information – and a data linkage information leaflet providing information on the linkages being sought, their purpose, the linkage process, how linkage has been used on other studies, the voluntary nature of consent, and ways to revoke consent (see Figure 1). Based on evidence from the pilot and the qualitative study, we advise survey practitioners to highlight the voluntary nature of linkage, include reassurances on data security, stress that non-consenters can still participate in the survey, and highlight the prospective nature of the linkages. Consistently with the literature, we suggest to keep the leaflet short and concise. Our research found that some participants only “skim read” and then ask the interviewer general questions about the procedure. Also, we advise to avoid wording that may be unclear or ambiguous, to provide definitions for unfamiliar expressions, to include examples, wording the leaflet as participant centred, and visualising the process using graphics and diagrams. Some respondents interpreted the term “withdrawal” as withdrawal from the whole survey (instead of withdrawal consent). Participants found confusing the use of “administrative records”, “administrative data”, and “records” as synonymous. Also, it was suggested to include the full department names instead of their acronyms. Given that the advance mailings may not arrive to all participants, as, for example, some may have moved, we advise equipping face-to-face interviewers with spare leaflets, and instruct telephone interviewers to direct participants to leaflets on the survey website. The adoption of different protocols by mode of data collection influences consent rates; consistently with experimental evidence (Burton, 2016; Sakshaug et al., 2017) we expect self-completion modes (web) to lead to lower consent rates than interviewer assisted modes (face-to-face and telephone), where an interviewer can attempt to persuade the respondent and the respondent has the chance to ask questions/clarifications. Telephone and face-to-face interviewers received extensive training on data linkage (e.g. thorough simulation exercises and detailed project instructions). Additionally, interviewers were asked to familiarise themselves with the data linkage leaflet. 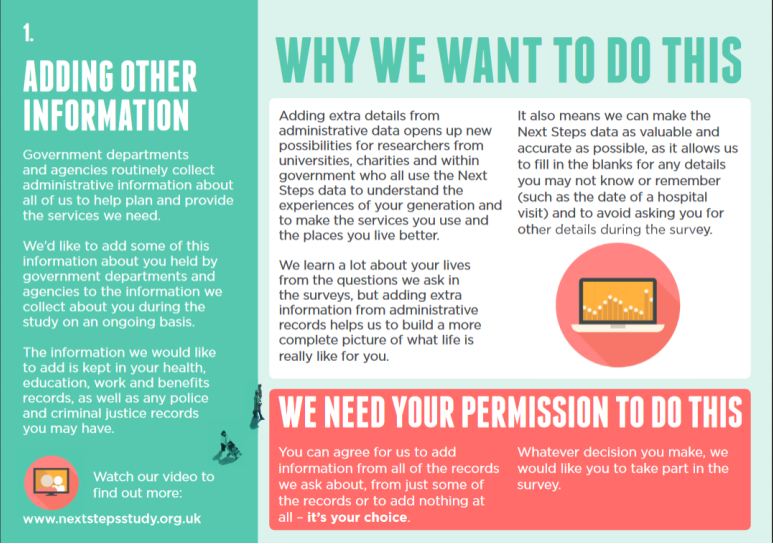 Moreover, interviewers could use the help screens embedded in CASI to gather further reference information; also, they could refer to a laminated ‘Data linkage FAQs’ sheet. 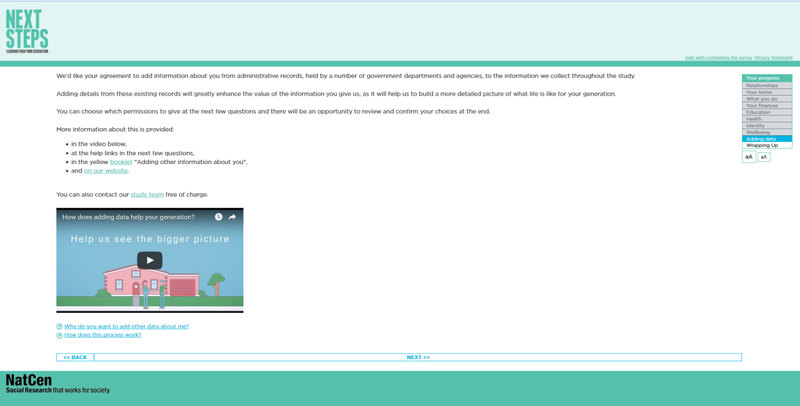 In the web questionnaire, several mitigation strategies were put in place to simulate the role of the interviewer – e.g., a video about data linkage addressed to participants. The web instrument allowed the adoption of web-specific features that could increase respondents’ understanding and that were inapplicable in other modes – e.g. hyperlinks to the data holders’ websites. Figure 2 shows the first page in the CAWI data linkage section; it includes the explanation of data linkage, an embedded video, which overviews the procedure, and two hyperlinks, which opened pop-up windows (Figure 3). Two different wording were tested on the introduction to the data linkage questions. One wording was framed positively (i.e. “The information you have already given us will be more useful if information about you can be added from these other records”) and one negatively (“The information you have already given us will be less useful if information about you cannot be added from these other records”). Participants to the qualitative study were asked to elicit which of the two versions they favoured. These wordings were not further tested in the pilot study. The overwhelming majority of participants to the qualitative study preferred the positively worded version; it was perceived that this acknowledged better participants’ contribution, it avoided a sense of moral obligation that participants may feel in the negatively worded version, and it was overall felt as more welcoming and inviting. The questions included the following content: a title, a consent question, and two answer options (Figure 4). The web implementation of the data linkage section allowed for the inclusion of several hyperlinks with additional information. 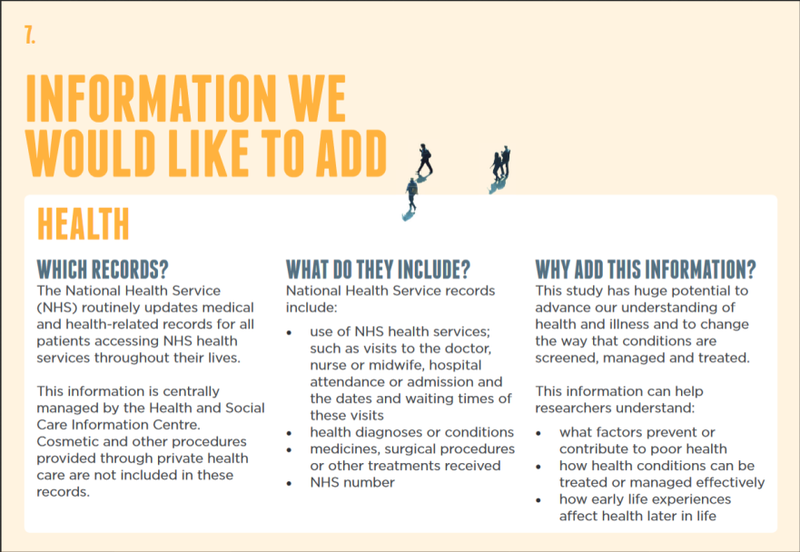 For example, in the consent question displayed in Figure 3, the “National Health Service (NHS)” hyperlink opens the website to the National Health Service and the hyperlink: “Which records would Next Steps like to add?” “open a pop-up window with additional information. This step was not implemented in the mainstage. 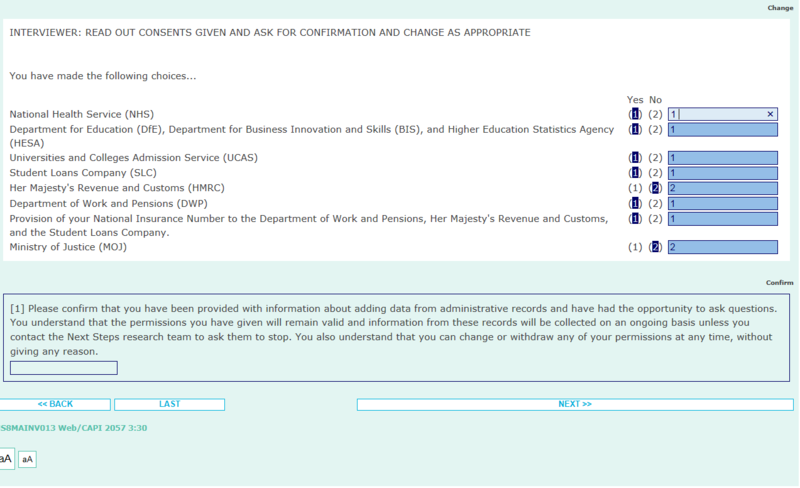 At the end of the section respondents (in web) and interviewers (in telephone and face-to-face) were presented with a screen summarising the permissions given (see Figure 5). The respondent has an opportunity to confirm the consent provided, and to change any consent given. In the face-to-face and telephone interview, the interviewer read out each listed record type and the response; if needed, the interviewer changes the responses provided in this same screen, without going back to the original question. Similarly, in the web interview respondents were asked to review and confirm the consent provided. After reviewing all consent choices, the respondent is asked to give confirmation, ticking a confirmation box in the web survey or accepting a confirmation statement in the face-to-face and telephone interview. In the web survey, an additional page was displayed to the respondent stating that written confirmation would be sent by post, and with an additional hyperlink with contact details for further information (see Figure 6). Written confirmation of the consent choices was sent to respondents in a “Thank you” mailing, which also included the incentive and a change of details card for future survey waves. Respondents were provided with information on how to withdraw their consent(s), and study contact details were supplied so that participants could get in touch with further questions/concerns. A post-survey confirmation of consent in hard copy worked well at the pilot, and the research team felt it was important from an ethical perspective to give respondents another chance to check that their consents have been recorded accurately and to keep for future reference. Some participants preferred a paper record (easier to keep and more formal); others preferred an email confirmation, on the grounds of environmental concerns and on a perceived easiness to withdraw consent, if an unsubscribe hyperlink is included. Participants expressed the desire to receive an intra-wave mailing or a “findings hand-out” describing how linked data contributed to research. Evidence from the qualitative interviews showed that the protocol was considered acceptable. Specifically, participants considered that the protocol appropriate to the complexity and sensitivity of the data linkage request, and not excessively burdensome. Furthermore, participants understood the necessity of asking nine different consent questions. However, the participants’ reaction to the consent request varied. In the pilot study, while some respondents did not have major (if any) concerns, others expressed strong negative reactions about the level of information collected, with a “big brother-ish” fear of being controlled, especially by the police and government bodies collecting taxes, and supplying pensions and benefits. As one participant to the telephone pilot study stated: “[I d]on’t mind doing study but not prepared to link data as that’s scary” (Quotation reported in the interviewer feedback form). In some circumstances, respondents did not have sufficient trust to consent. As one telephone participant (in the pilot study) stated: “I don’t know if I can trust who you are. Really I only have your say so, too many things happen these days.” (Quotations reported in the interviewer feedback form). While the consent procedure was considered easy, the comprehension of what was being asked was limited. Participants can be clustered in four groups according to their comprehension and willingness to provide consent (Figure 7). Evidence from the qualitative interviews showed that participants could belong to different groups across different consent questions; the level of comprehension often changed during the qualitative interview, with participants moving from a lower to a higher comprehension group. An improvement in comprehension was often associated with a higher likelihood to provide consent, driven by an increased understanding of the benefits of data linkage for society and for the participants’ survey experience. 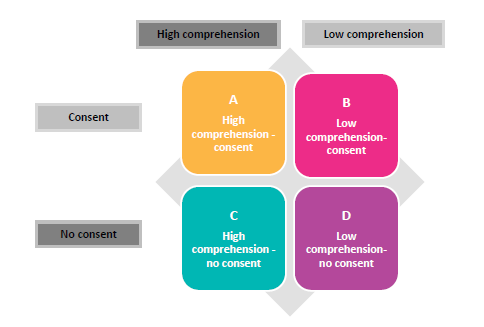 We identified six factors underpinning comprehension and consent (Figure 8). Overall, asking consent to data linkage on multiple domains leads to an efficiency gain, as participants capitalise from each question and the comprehension of the request requires less effort for each additional question. Participants were more likely to give consent if they have already given consent to a request in the same domain, in order to be consistent with their previous choice or because they (mis)believed that consent to a current question presupposed consent to subsequent questions. While participants became gradually aware of the volume of information that they were asked to share and that are held on them by various organisations, this awareness did not necessarily impact negatively on consent. Participants in the qualitative interviews were presented with eight different benefits to data linkage. Understanding which of these benefits are the most salient is important: these may be used as leverages to increase consent. Table 3 presents a summary of the proposed benefits and the participants’ reactions. The qualitative and pilot study showed that linking survey data with past individual record was understood and considered acceptable. Conversely, participants didn’t initially consider the possibility of their survey answers to be linked to future records. For example, one participant stated: “It wouldn’t change my opinion on that, I would still say yes, but I was just thinking up to the present” (Male, medium education, in work). They expressed a preference to limit their consent in the future and claimed that an annual reminder about their on-going consent would be beneficial, especially if there are gaps in running the survey. Data linkage may be influenced by the sensitivity of the consent request. As in survey questions in general, whether a consent request is considered sensitive or not depends on whether the sample member engages in any socially undesirable behaviour or has a socially undesirable characteristic associated with the request. Participants anticipated that study members may have concerns about sharing their records if they have had a health condition or treatment that they are not willing to share with others (e.g. mental health problems). Participants in the qualitative study did not consider all consent requests as being sensitive to the same degree. For example, within the educational area, the only question that raised concerns was the consent to link data from the Student Loan Company; since this institution does not only deal with schooling but also with financial information. In the pilot study, depending on the mode of data collection, and on the consent type, consent rates range from 47% to 89% (graph 1). Even though participants were randomly allocated to different survey modes, so that selection into mode does not undermine the mode comparison, given the small sample size, it is not possible to derive definite findings on mode effects. Nevertheless, the evidence of a higher consent rates in face-to-face (78%), followed by telephone (71%) and finally by web (61%) is consistent with the hypothesis of higher consent rates in modes that allow for an interviewer persuasion, suggesting that with a larger sample size we might have been able to conclude that consent varies by mode of data collection. Mode differences emerged in the feedback from interviewers in the pilot study. Face-to-face interviewers reported more positive feedback than telephone interviewers. In the telephone mode, some participants were hesitant and reported that this was an excessive and too intrusive request; despite the reassurances of data security and the voluntary nature of consent, the request put some participants off taking part altogether. Conversely, face-to-face interviewers stated that respondents had read the leaflet, and had no concerns in answering the question, even if some did not give consent to all the consent requests. In the mainstage of the study, the number of participants who completed the data linkage section was 7,502 (of the 7,707 productive interviews). Depending on the mode of data collection, and on the consent type, consent rates range from 44% to 90% (graph 2). In the mainstage study, participants were not randomly allocated to different survey modes – thus, selection into mode means that differences in consent rates by mode may be driven by the characteristics of those who chose to participate in that mode. Nevertheless, the evidence of much higher consent rates in face-to-face (89%) and telephone (90%) than by web (69%) is consistent with the hypothesis of higher consent rates in modes that allow for an interviewer persuasion, and with findings from the pilot. For all modes, consent rates are higher for the mainstage of the study than in the pilot study. Overall, despite the extensive efforts to incorporate features designed to maximise consent in the web mode, the consent rates for those completing the questionnaire on the web remained much lower than in face-to-face and telephone. 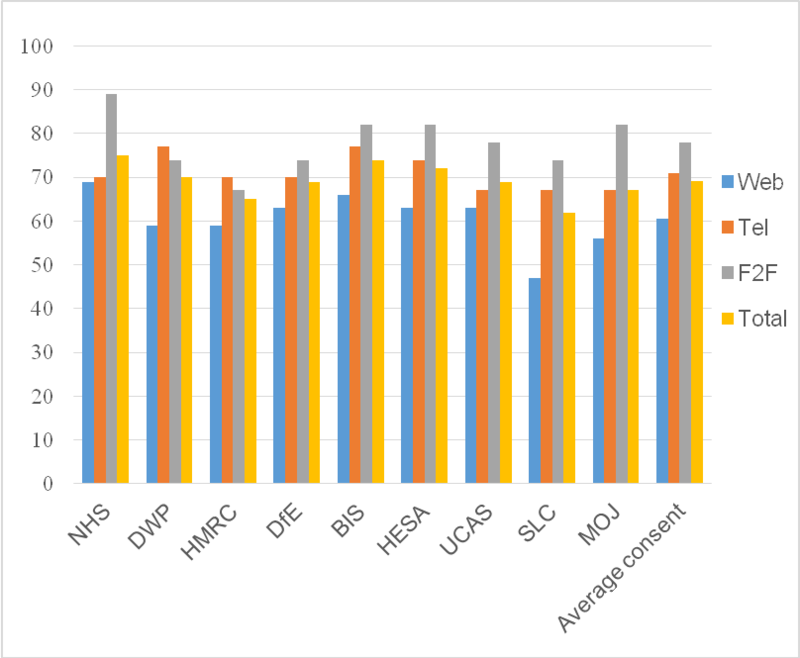 Looking at the overall response rate per consent type, the lowest consent rates where those related to economic records (DWP, HMRC) and the student loans company (SLC). In this paper we investigate the challenges of asking consent to data linkage in a mixed-mode context; we analyse whether it is feasible to ask consent to multiple domains simultaneously and on future records; and we discuss the best practices in designing materials to promote consent. Overall, respondents considered it acceptable to give consent without signing forms. As opposed to signed consent, this protocol minimises respondent burden and survey cost. Experimental evidence from the pilot study seems to suggest higher consent rates in face-to-face interview, followed by telephone and finally by web; although the small sample size of the experiment doesn’t allow to derive conclusive evidence. The descriptive analysis of the consent rates in the mainstage Next Steps Age 25 survey shows that consent rates were much lower in web than in telephone and face-to-face. This provides indicative evidence that the mitigating steps we implemented to simulate interviewer role in the web survey (e.g. a video describing the procedure, and hyperlinks to the data holder institutions) were insufficient. We could recommend that other studies implementing data linkage consents in a web survey consider further steps such as telephone call back for non-consenters. Having said that, as participants self-selected into mode, the descriptive analysis does not enable robust conclusions about mode effects on data linkage consents. Qualitative interviews showed that, overall, asking consent to link records from multiple domains is considered acceptable, and separate questions are preferred to a unique “catch all” item; we also find evidence of an “incremental effect”, with respondents capitalising from previous questions, leading to a lower cognitive effort, at each subsequent request. Consent rates varied by domain. Data linkage in the domain of economic records and records held by the Student Loan Company obtained the lowest levels of consent. Further research may compare the response propensities on different domains by socio-demographic group. 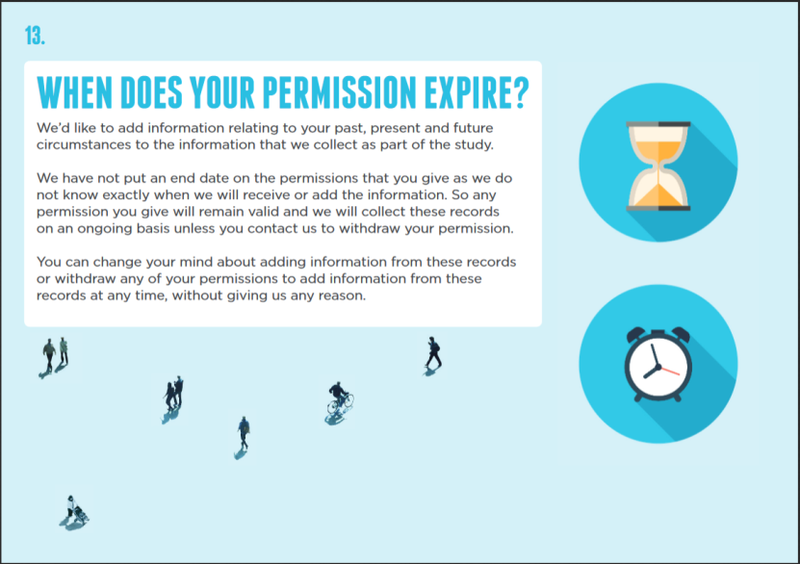 Regarding the timespan of consent, we advise survey practitioners to carefully word prospective consent requests, as cohort members may find it complicated to understand and welcome linkage with future records. One limitation of this study is that this evidence is limited to a specific age cohort; further research may replicate these findings on different age groups and/or in different countries. Al Baghal, T., Knies, G., & Burton, J. (2014). Linking administrative records to surveys: Differences in the correlates to consent decisions. Institute for Social and Economic Research University of Essex. Understanding Society Working Paper Series, (2014-09). Colchester: University of Essex. Al Baghal, T. & Burton, J. (2016). “Does interviewers’ attitudes towards sharing personal information affect the consent rate they achieve?” Background paper for the 5th Panel Survey Methods Workshop 2016, Berlin. Burton, J. (2016). “Results for Web/Face-to-Face Linkage Consent Questions in the Innovation Panel.” Presented at the Mixing Modes and Measurement Methods in Longitudinal Studies Workshop. London: CLOSER. Jenkins, S. P., Cappellari, L., Lynn, P., Jäckle, A., & Sala, E. (2006). Patterns of Consent: Evidence from a General Household Survey. Journal of the Royal Statistical Society (Series A) 169 (4), 701-722. Korbmacher, J. M., & Schroeder, M. (2013). Consent when linking survey data with administrative records: the role of the interviewer. Survey Research Methods 7 (2), 115-131. Sakshaug, J. W., Hülle, S., Schmucker, A., & Liebig, S. (2017). Exploring the Effects of Interviewer-and Self-Administered Survey Modes on Record Linkage Consent Rates and Bias. In Survey Research Methods 11 (2), 171-188. Sakshaug, J. W., & Kreuter, F. (2012) Assessing the magnitude of non-consent biases in linked survey and administrative data. Survey Research Methods, 6 (2), 113-122. Sala, E., Knies, G., & Burton, J. (2014). Propensity to consent to data linkage: experimental evidence on the role of three survey design features in a UK longitudinal panel. International Journal of Social Research Methodology, 17 (5), 455-473.